Mall of the Emirates, one of the most popular shopping malls in the United Arab Emirates, has teamed up with JCDecaux Dicon, the Middle-East subsidiary of JCDecaux, to launch a digital campaign at Dubai International showcasing Dynamic Content in Arabic, Russian, Chinese and English based on flight schedules, making their communication more relevant to the consumer. The technical innovation, provided by JCDecaux’s digital creative hub ‘JCDecaux Dynamic’ offers brands new and exciting opportunities to reach their target audience through contextually aware advertising and innovative creative, these messages are adapted to the time of day, the type of audience, the weather conditions or real time feeds linked to a multiple number of visuals. 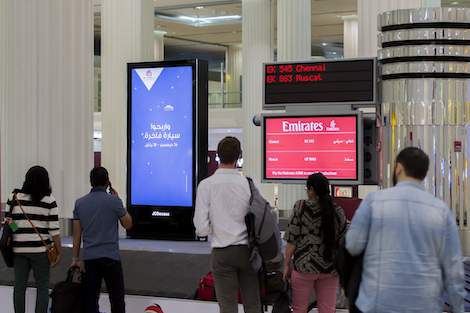 The Dynamic Campaign, which is a debut at the world’s busiest international airport Dubai International, is taking place on a network of 58 screens located on each baggage carousel of terminal 3, the airport’s busiest terminal, allowing Mall of the Emirates to convey their message strategically at a key location with a dwell time area to a primary target audience. JCDecaux operates in Dubai with its subsidiary JCDecaux Dicon, handling exclusively the advertising in Dubai International, the world’s busiest airport for international passengers for 3 consecutive years now; as well as in Dubai World Central, the world’s largest passenger and cargo hub upon completion. This entry was posted on Monday, January 30th, 2017 at 06:16 @302 and is filed under DailyDOOH Update. You can follow any responses to this entry through the RSS 2.0 feed. You can leave a response, or trackback from your own site.